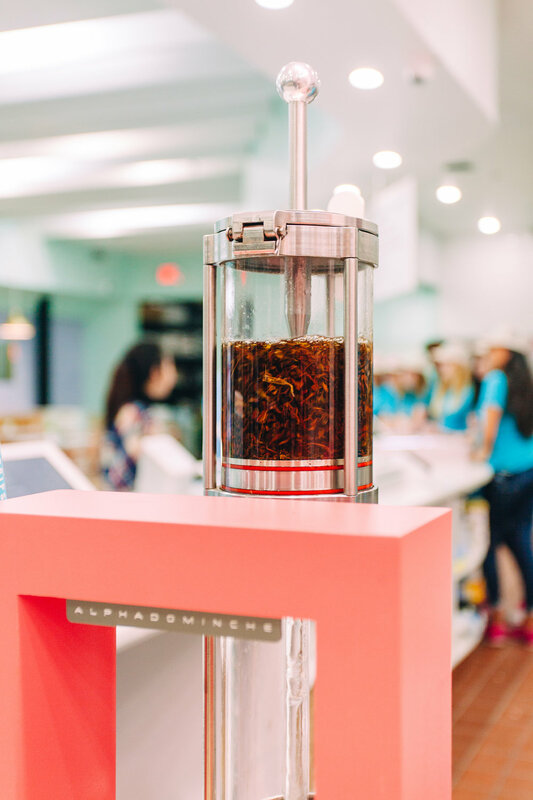 Our coffees and teas are brewed using a super special custom machine called the Steampunk, made by Alpha Dominche. Highly-engineered to remove the variables that cause impurities in your cup, the Steampunk is a reimagining of a siphon-style brewer, which maintains steam-heated water in contact with grounds in a top chamber, then extracts the mix through a filter by drawing the water into a second chamber below using a vacuum of air. 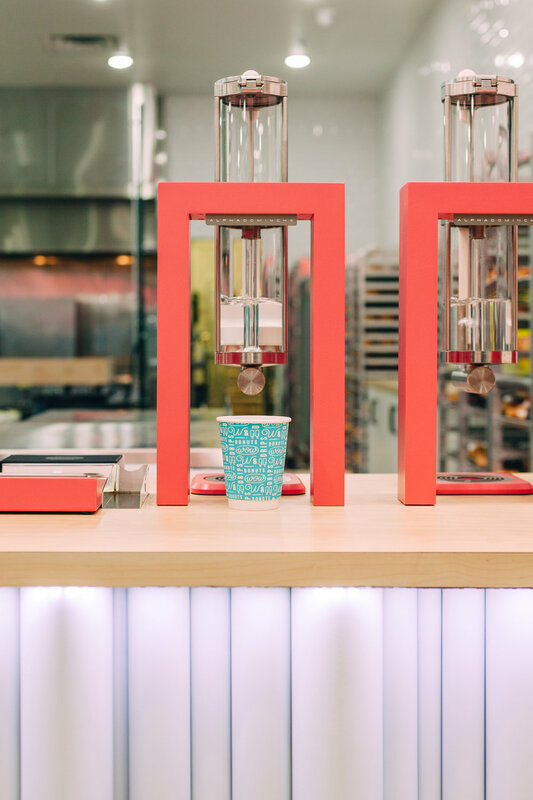 Every coffee and tea has its own special recipe of the ideal temperature, time, volume, and agitation, pre-programmed to make the perfect cup every time! Feel free to ask questions about your cup while we brew, we’re excited to share this new brewing method with you! We are proud to introduce you to the women of Hingakawa Women’s Coffee Cooperative. The Hingakawa (“Let’s Grow Coffee”) Association is actually only one half of the Abakundakawa-Rushashi (“Those Who Love Coffee”) Cooperative which was formed in 2004, becoming the first women’s farmer association of its kind in Rwanda. The other half of Abakundakawa Rushashi is the Dakundakawa (“We love Coffee”) Association, also 100% run by women. Both associations are located in the northern, mountainous regions of the Gakenke district, situated at 1700-1900 meters elevation and spread across five distinct zones. The coffee is a bourbon varietal, washed and sun dried. This coffee from Hingakawa is the real life representation of the sacrifice and resolve of the female cooperative members who were daring enough to plant seeds of hope on the very same Rwanda hilltops where many lost their lives in a violent civil war. The two co-op associations employ both Hutu and Tutsi women, the two tribes who were infamously at the center of the heart wrenching conflict. After Rwanda’s coffee producing farms were for a time left deserted, several organizations began to assist in restarting production. Hingakawa, as the name suggests, is more of a chant than it is a mere statement; it is a resolution to fight against poverty rather than each other, and with this sentiment they have been able to move forward and heal their community through cooperation and leadership. Established in 1994, TEALEAVES is one of the very few tea blenders in the world, known for crafting the highest quality teas in small batches by hand. TEALEAVES strives for perfection, driven by the never-ending quest to make the perfect cup of tea. 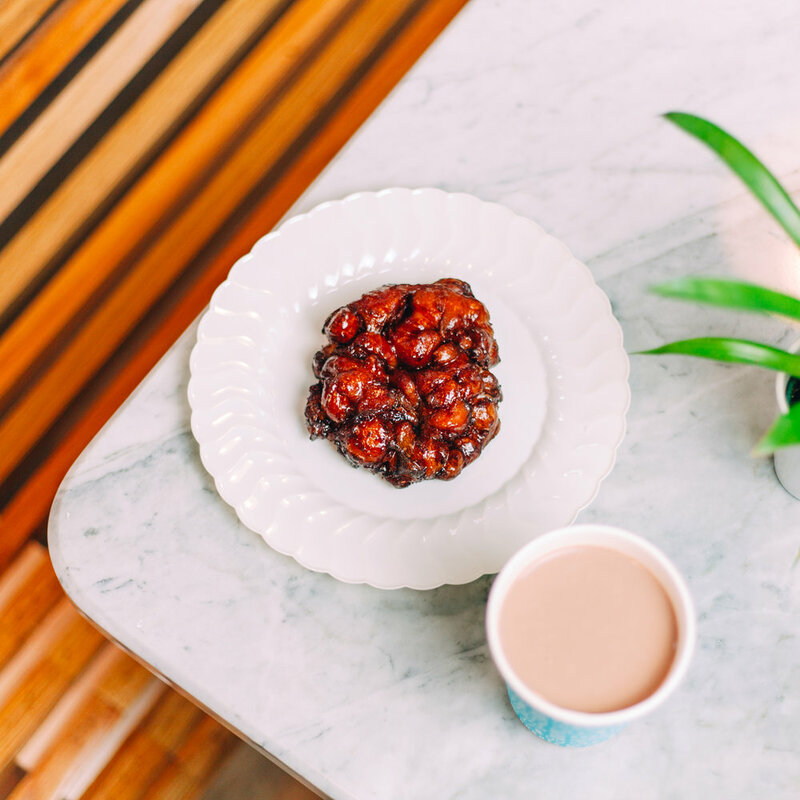 With the philosophy of inspiring creativity and connections through the art of blending, TEALEAVES has gripped the hearts and minds of five-star hotels and Michelin Star chefs, worldwide, as their tea brand of choice for over two decades.